What's next? What chance do think there is we will see a season 4? What chance do you think there is we will see a season 4? Re: What's next? What chance do think there is we will see a season 4? baxter wrote: Jasper- that was very persuasive! Another fun thing is how back when we'd never seen the deleted scenes from FWWM, Al Strobel used to sometimes lead audiences in a reenactment of his candle ritual. baxter wrote: I feel like I really should go to this tour in Australia. It's not everyday you get to see stars from Twin Peaks in your own town. Then again, I find these "in conversation" things to be really annoying in general. Some people ask great questions and get no answers, others ask crap questions and it all drags on. The great Al Strobel is nearing 80, if I'm not mistaken. If he can make the long trip to Australia, with but one arm, then you can surely make it across town. In fact, you owe it to him. It's the least you can do! Besides, how many more trips to Australia do you think Mr. Strobel will be making? This is probably your only chance to see this Twin Peaks legend in the flesh. He's an intelligent man who really thinks about his work, and much like many of us here, he's not afraid to jump straight into talking about interdimensional beings. Hell, he could even end up spilling the beans about why he's billed only as Gerard rather than as MIKE in season three. I remember he once discussed why MIKE had Gerard's appearance in the Red Room in FWWM. You really ought to go check it out, and of course report back to us here on the forum. Is there a video of Al talking about why MIKE has Gerards appearance? That would be interesting to hear Als thoughts on hes character. Terence wrote: Is there a video of Al talking about why MIKE has Gerards appearance? I believe there was a video, but I don't remember the event. This was a number of years ago. Maybe it was the USC event, but I'm not sure. From what I can remember, Stobel said that Lynch thought that the image of MIKE in the form of Gerard just made visual, artistic sense, and felt correct. I'd agree, even if we can argue about the logic. Those FWWM scenes with Strobel in the lodge are powerful. He looks very stern and regal, and it feels right when he commands BOB to hand over the garmonbozia. Ohh it makes sense of course that the spirit of MIKE i guess after been in Gerards body for so long & getting up to all sorts with BOB decided he liked this look of Phillip Gerard which he took on for hes own look.. Even though yeah we also know Phillip Gerard was using chemical injections to try & stop & block out the spirt of MIKE throughout seasons 1 & 2. Definitely by season 3 MIKE could taken over Gerards body full time seeing as it was decided to call him just Phillip Gerard in the credits & all. Does anyone know of the specifics regarding the rights Showtime has over the show? If a network was to buy and distribute a licensed product wouldnt the negotiation and contract cover future rights like "if we decide to greenlight a new season..."
I get the feeling when season 3 was announced by Lynch Showtime felt that was necessary because he was a co-creator of their new product. I now get the feeling this is Showtimes baby also since season 3 was made. Does Showtime have any leverage concerning a new season? greg4882 wrote: Does anyone know of the specifics regarding the rights Showtime has over the show? 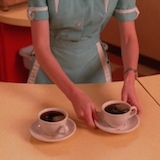 I don't think anyone knows the specifics about this stuff, which is probably quite complex, but I think that we can say that Twin Peaks is so deeply entangled with Showtime that the odds of a Twin Peaks season four happening anywhere else are vanishingly small. As far as leverage, I don't think that Showtime can demand anything (like a 4th season), but one thing that they could do is sweeten the pot by allowing a bigger budget. The actors being paid scale is what caused us to lose Michael J. Anderson (who wouldn't accept scale and subsequently went off the rails), and perhaps Michael Ontkean (who seemed to be game until suddenly he wasn't). Lynch also complained about not having enough budget for all of the fx. The only regret Nevins has is not offering Lynch the deal he wanted up front. In April of 2015, Lynch tweeted he was leaving Twin Peaks. Nevins quickly won him back. “The only thing I would do differently is I would have given him that deal three weeks earlier,” Nevins said. Last edited by Jasper on Sat Jul 07, 2018 8:47 pm, edited 1 time in total. Thank you for that info. It seems if Showtime really wants they can make it happen which means is it worth it to them? greg4882 wrote: Thank you for that info. It seems if Showtime really wants they can make it happen which means is it worth it to them? I actually don't think that Showtime can simply make it happen, because budget isn't the only issue. 1. Do Lynch and Frost have ideas that sufficiently excite them? 2. Does Lynch feel like continuing the Twin Peaks story more than he wants to do other other types of art-making, or even other directorial projects? Without them? No, I don't think so. I think that whatever new deal they struck for season three would certainly give Lynch and Frost some kind of control over that, and would likewise probably prevent Lynch and Frost from taking it elsewhere without Showtime's permission. Lynch recently commented that back when he temporarily quit the project over the budget, he probably would have let them do it with other directors if it came to that. While I don't think that Showtime ever tried to go with replacement directors (which would have embarrassed them and cost them a lot of the cred that they were looking to build), the fact that Lynch said that he probably would have let them implies that he has some say in such matters. For what it's worth, I would have preferred no season 3 to season 3 without Lynch's directorial involvement. I feel the same way about any potential season 4. I'm about as interested in Twin Peaks without Lynch writing and directing as I am in Disney's fake Star Wars (meaning not at all). It would be a tragic farce for Twin Peaks to become a franchise of that sort. I think L/F have final veto power over any incarnation of TP. They maintained ownership of the property through Lynch/Frost Productions, Twin Peaks Productions, and Rancho Rosa. Other companies have only participated as production companies and distributors, not owners of the intellectual property. Whether L/F could set up shop anywhere but Showtime is a question of contract, but I’m certain that Showtime and CBS can’t do anything without L/F’s approval. Recall that CBS had a TP comic book scripted by Bob Engels all set up to go as a DVD tie-in in 2007, and DKL nixed it. Lol that just made me visualize Lynch selling out Twin Peaks to Disney. What a tragedy that would be! It'll never happen without Lynch and Frost. Period. Not even a possibility. Mr. Reindeer wrote: I think L/F have final veto power over any incarnation of TP. They maintained ownership of the property through Lynch/Frost Productions, Twin Peaks Productions, and Rancho Rosa. Other companies have only participated as production companies and distributors, not owners of the intellectual property. Whether L/F could set up shop anywhere but Showtime is a question of contract, but I’m certain that Showtime and CBS can’t do anything without L/F’s approval. Recall that CBS had a TP comic book scripted by Bob Engels all set up to go as a DVD tie-in in 2007, and DKL nixed it. It seemed like Showtime had the rights to go ahead and film at least the season 3 script, with or without Lynch's blessing. In theory, Twin Peaks could bgo on without Lynch and Frost is they decided to do like George Lucas and sell out to the white slavers. Practically, though, I doubt Lynch would ever sell out like Lucas did, and since the audience of Twin Peaks is a relatively small cult audience, not sure if it would be profitable under a different director.